Scan the barcode on the bottle for accurate and efficient wine data entry. Single Line Aiming, 2500 pixel sensor. Trigger switched, auto discriminate on all popular bar codes. Plug and play, then use the barcode wizard in The Uncorked Cellar. Uncork or find wines by scanning a barcode. For accurate and efficient wine data entry to quickly identify a tagged bottle. 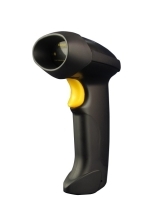 CCD scanner, trigger switched, 100 scans/sec, 0 - 25mm read distance, auto discriminate on all popular bar codes. Keep your USB Barcode Reader tidy and in its place using this handy holder.